What I came away with, that which stays most prominently in my mind is the importance of keeping open communication with others even when we don’t agree, and the importance of patience and perseverance when there is a breakdown of communication and the potential for conflict. Oliver is particularly involved in east west relations and conflict resolutions. I also note his comments concerning the fact that religion has an ambiguity towards violence, and also that peace processes often fail because the religious factor has been ignored. He stressed the need to understand religious motivations and adopt a mindset which can understand the other in the sacred spaces where we are able to connect with what we find in common. People can have a spiritual sense of what life is about which is shared, even if there is disagreement over certain matters. There is always a place on a human level where we can connect with each other. He also talked about how we have grown to privatise our faith, but that faith places an obligation on us to shape the world and to see that each person is able to live in the justice that God intended them to experience. How we define our spirituality should not stop us responding with sensitivity and awareness to what is going on around us. This is the real mark of the spiritual. We tend to try and stay in our comfort zone but need to embrace the unpredictability of God. It’s very easy to be tempted by reasonable arguments and a sense of righteousness which can stop us from relating with people on a human level. We cannot circumvent the painful moments in the lives of others. 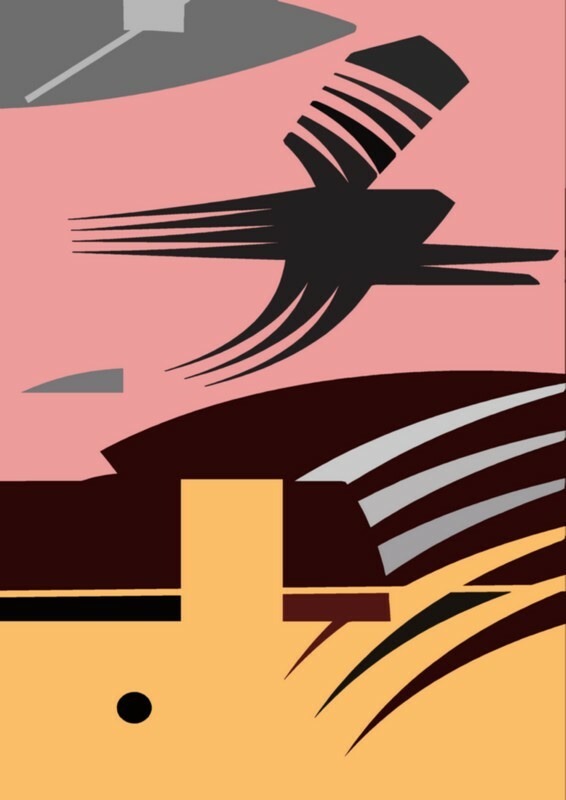 He noted that the spiritual framework can be symbolised very well in the sign of the cross… the line travels both horizontally and vertically… relationally it is something which needs to happen both ways. The divine and the human. A recent painting… I am pleased with this as it seems to flow in a bit of a stream of my work which I feel runs true to the main current. It makes me feel the way I feel when I look at a painting by Corot, which is good with me, as I love his painting! It’s on linen, 40x60cm in size, painted in oils. I soon begun to think along the lines of the Garden of Gethsemane, but kept the title more open. Gethsemane means literally “oil press” though, which I find an attractive thought. Maybe I will end up doing what I often do and giving it two titles! So Contemplation/Garden of Gethsemane. I think the title of a painting is very important, and sometimes emerges in phases. I’m starting to rest on the two titles together. On the one hand I like the title not to reveal too much, because I feel if someone wants it very much, then it would almost need them to re-title it, so what is the point of making the title more particular! On the other hand, I feel it might be interesting to hint at the meaning of the work for me. So the general and the particular in a title is good. I found out after painting this painting that Andy Goldsworthy made 14 chalk stones of approximately 6 foot diameter and placed them in chosen locations along a five mile trail on the South Downs between West Dean Gardens and Cocking Hill. 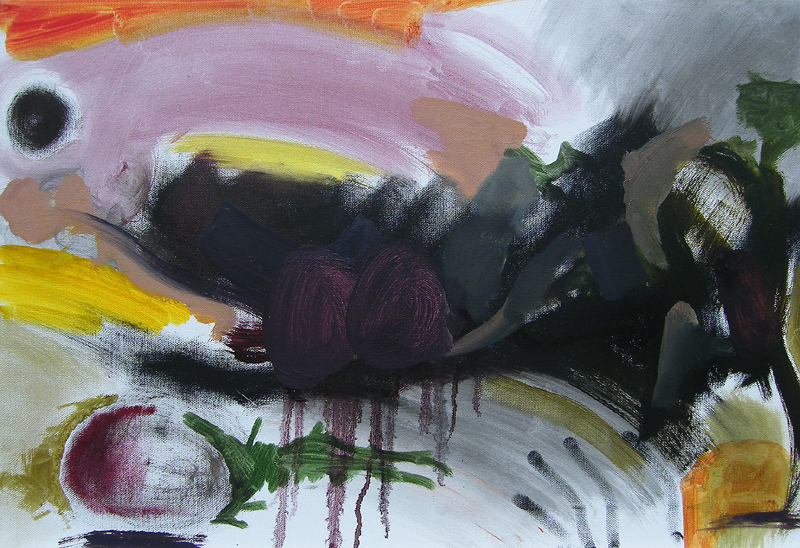 (in 2002 I think) This painting was painted from (or rather, based very loosely!) on a sketch drawn from observation of the scene before me, as I looked out from the front of West Dean and over towards the chalk stone. I have wondered if I should change the title to “Chalk Stone” to make the relationship with what it was based on clearer, but I like the “lump” because it expresses an emotional blockage and makes me think of a “lump in the throat” and is therefore more accurate in that respect. I have other paintings of Andy Goldsworthy’s chalk stone at West Dean which I painted at that time and also afterwards, because as a motif I like it very much. Something just there, incongruous but present. A “lump in the throat” is described in medical terms as “globus” and it used to describe the sensation of a lump in the throat where no true lump exists. It was once called Globus Hystericus, and is sometimes also referred to as Globus pharyngeus. It is related to many things, two of them being stress and tiredness. I am experiencing globus quite lot myself at the moment, and I do think emotional tension and trouble expressing grief and deep sadness may be related to it. A kind of holding in of emotional tension which needs to be expressed. Some people experience a lot of trauma in life, from a very young age, and this can accumulate and cause problems later if the emotions and thinking are not worked through and faced. In the process of working through the tangle (via psychotherapy), sometimes a backlog of grief builds up, and you feel it. This is my thinking on the emotional “lump in the throat” matter. It doesn’t worry me…I have learnt to embrace it as part of my experience, and I think, used in the right way, these odd ways our bodies express themselves can be helpful to us if we heed their complaining and act accordingly. For me, it is more rest, less doing, more chance to allow my emotions to have their own say in things a bit more then they usually get as I rush from A to B and try and achieve more than I need to! Concerning the external “stones”, these things will always be here, things which block and get in the way of love, of truth, of the light. But maybe, with a commitment to the truth, to seeking truth, through living with as much integrity as we can, time will wear them down, and we, in some way, may help the process by choosing to love, in and through all. On the psychoanalysis/art topic, this looks great… The text is from the Freud Museum website and a few other places! Grayson Perry won the Turner Prize in 2003 and delivered the 2013 BBC Reith lectures. His major exhibition The Tomb of the Unknown Craftsman was shown at the British Museum in 2011-12. He has exhibited his ceramics, sculptures, prints and textiles widely for 30 years and has also written a weekly arts column for the Times and made radio and television documentaries. Valerie Sinason is a poet, author, child and adult psychotherapist and adult psychoanalyst. She is Director of the Clinic for Dissociative Studies and Honorary Consultant Psychotherapist to the Cape Town Child Guidance Unit. The Special Edition includes articles by Kenneth Wright, Lesley Caldwell, Sharon Kivland and Patricia Townsend, transcripts of talks by Grayson Perry, Martin Creed and Valerie Sinason and an afterword by Juliet Mitchell. It’s fully booked now, so I have missed the boat. The conference ‘Psychoanalysis and Artistic Process – a day of dialogues between artists and psychoanalysts’ took place on 25th February 2012 at University College London. It’s worth bearing in mind that it is the space and the services of the gallery you get and usually that is pretty much it. There may be a little advertising in the organisations existing framework, but it’s up to you to promote your work…So you still do the hard work. And while giving you a nice platform to display yourself and your work, and maybe a good venue address for your CV…and good experience of exhibiting… it is possible to get experience of exhibiting your work in other ways, ie through open studios, art fairs, and approaching restaurants, hotels, bars, theatres, community organisations and community centres, etc. These alternative venues may not have the perceived “status” of a gallery in a London setting, but everyone in the know knows which galleries are hired out to artists in this way, and so no extra value will be placed on your work by showing at a hired space. The only possible benefit would be that it would demonstrate the way that you value your own work, which is a good thing, and also possibly that you have money to spend on such ventures. It may also be perceived by those who know nothing of how this system works, as being an endorsement that your work is of particular worth. So if you are in a position to do it, it is probably worth considering. However, I wanted to add this into my journal because it is very easy to become disheartened if you are an artist with little or no disposable income…it is easy to feel that doors are closed to you if you don’t have the cash. However, this is not the case, and one should persist in seeking open doors…They do exist, and if you look for opportunities to show and share what you do, they will come. You seek them, and you offer your art as a service, which it is. Be creative! Couldn’t resist showing this. Sad. Hard to imagine if this person is looking around them? Forms created by animals and the natural world underlie most of Hilary’s work: in particular the way shape and colour interact with each other. 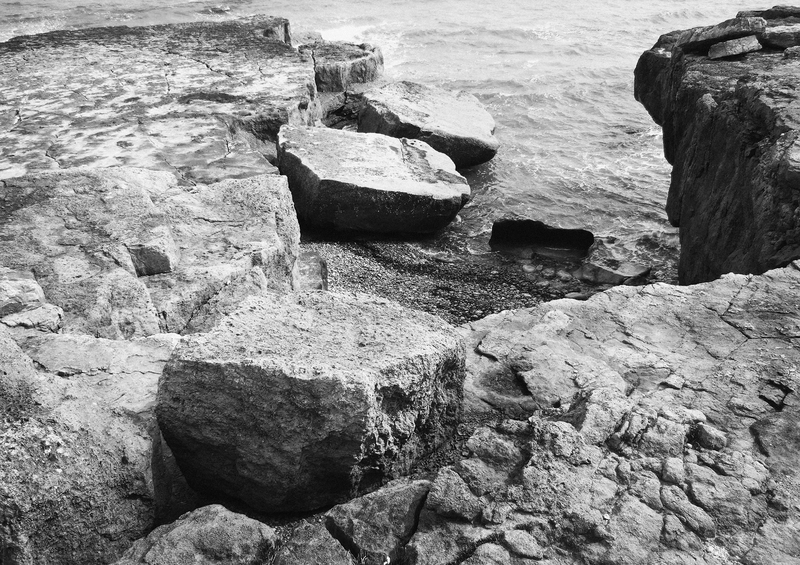 She uses her photographs to create images that can range from naturalistic to highly abstract. Hilary embraces a very wide spectrum of ways to express her ideas creatively. She has produced work using acrylics, watercolour, etching and relief printing, pencil, photography, and most recently, the iPad. The two process led paintings I am showing stem from my imagination, and reference both present and past visual and emotional experiences. The process of building up the painting is slow, which means on some days I might only add a couple of marks! 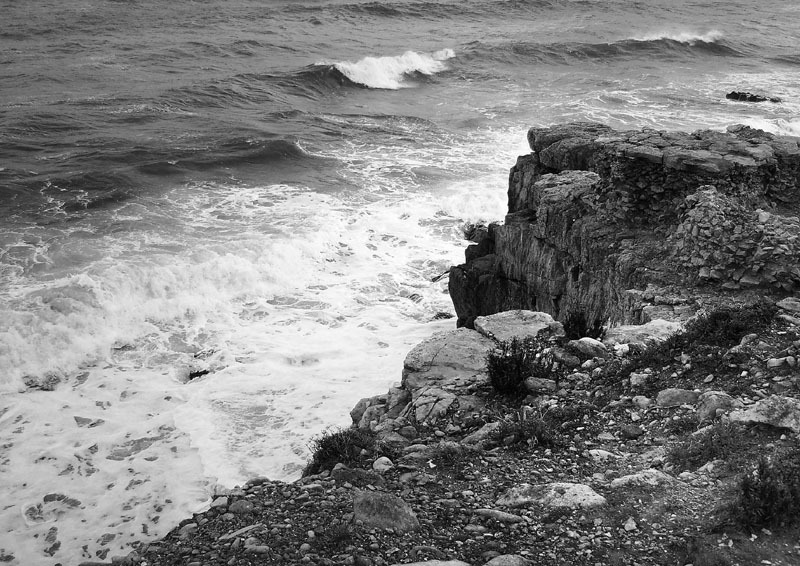 The analytical reviewing of the works formal elements and time spent simply looking at the work to determine how it resonates emotionally is part of a contemplative practice requiring openness and reflection. This is true of all my paintings, even those more figurative, but especially so with non-objective or highly abstracted paintings. I draw on my own subconscious in an attempt to locate some of my most central concerns, emotions, and thinking. As the paintings develop, subject matter emerges, which you can see reflected in the titles. 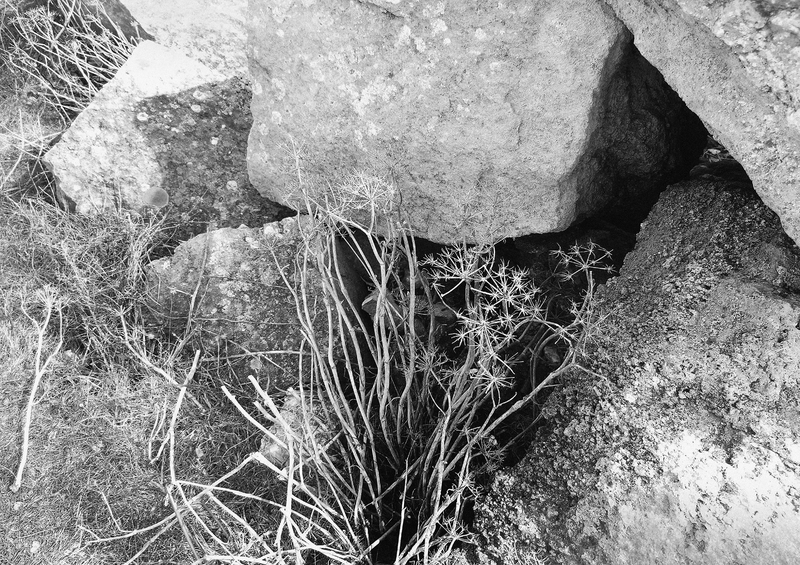 I am also exhibiting a black and white digital print which is an example of another strand in my work through which I delight in the pattern and dramatic impact of the natural world and its forms, which ultimately initiate and enlighten the imagination for even the deepest inner thoughts and images. Human experience, emotion, and my own personal life journey form the centre of my work. The brokenness of human experience fascinates me, as well as the potential for growth and renewal. After a BA Honours (Literature) in 1994 and a PGCE in 1995 I taught in Primary Education. I now use teaching skills integrated with nine years experience as an artist to occasionally offer tuition in painting and drawing. I am based in Chessington, Surrey, and I exhibit widely across the UK. In my original prints I combine hand with digital photographic techniques. I capture the beautiful details found in plant and flower structures through controlling light and composition. 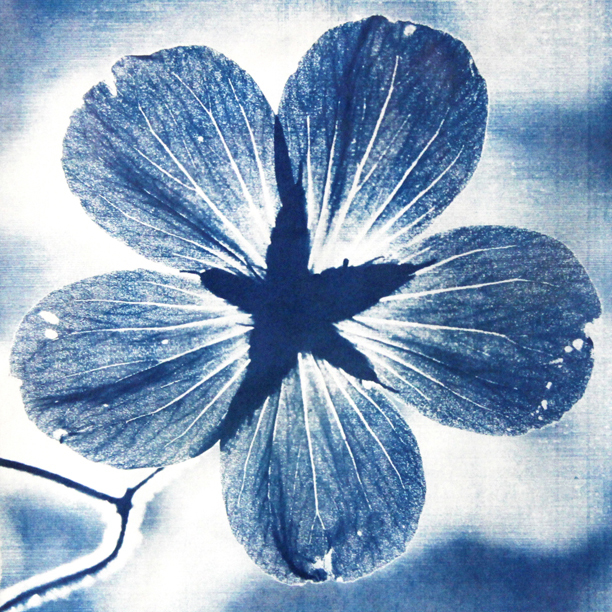 My methods include hand drawn monoprints, cyanotype sun prints and digital macro work. I find the geometric patterns and structures found in flora fascinating. Representing these natural forms with intricate mark making and precise photographic techniques becomes a meditative process. Revealing tiny, hidden details through intricate, hand drawn studies and macro lenses emphasises the beauty found in even the simplest natural forms. 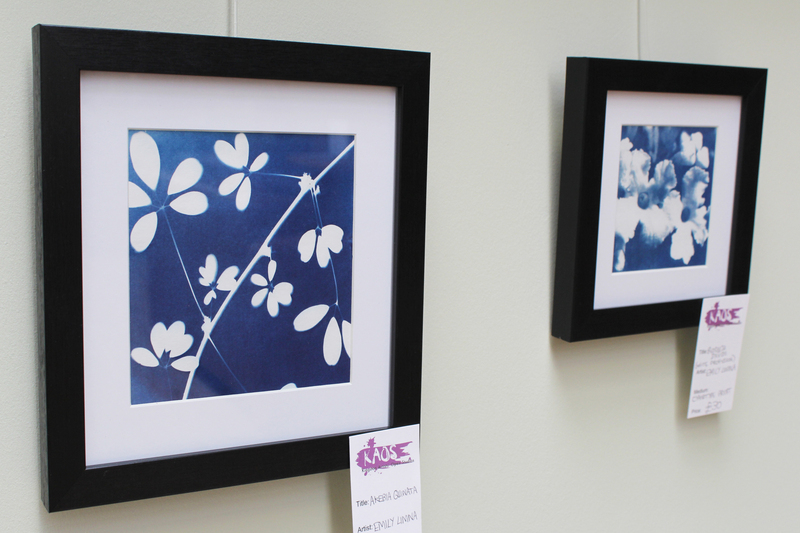 The three cyanotype prints shown are rooted in nature through both content and technique. I select natural forms for their structure and behaviour with light. The tiny veins in geranium petals glow with the backlit rays of sunlight. These sun prints are exposed in my garden. Some are direct photograms and others are using negative transparencies of my macro prints. In a current project with a local writer I am creating a limited edition children’s book. My images for this publication playfully combine miniature figures and animals with the surrounding world. Emily is also a teacher and examiner of Art, Design and Photography in London. Well, “Sacred Spaces” is coming up in May, but for the present time I am having a little well earned break from the organisational tasks involved…I got those done early because I know how incessant it can all seem. Apart from a little bit of publicity, I’m not needing to spend time on it right now. Which is GREAT! I have some time to look at other peoples work a bit more! Well, that is kind. My choice of cereal for breakfast. In our house this is no small matter. If your choice of cereal is not there, all hell breaks loose, it does, completely. Maybe only slightly worse is the situation where there is a very small amount of cereal in the packet, but the person before you has scoffed pretty much all of the rest. So the title, it relates. How it relates to the painting will maybe need to remain something nice and personal to the painter himself, unless you happen to ask. This is good. It is kind. It makes the start of my writing very simple. And the painting is kind too. The colour is kind. Yes, colour can be kind. It can relate respectfully to its surrounding colours, yet shine. It can take up its room, and not trespass on someone else’s room. This happens with this painting and it happens with all of Clyde’s paintings (well, those I have seen (on the net) so far. It is not easy to use so many colours when playing with space on the picture plane. I have only just started to touch on what a skilful, sometimes painful, task this can be. So I am not surprised I find these paintings inspiring. In my own painting I am tending to prefer soft edges rather than hard edges, but the undulations in this painting are just sufficient to relieve me of any “hard line stress” (invented term!) that otherwise may creep into my mind as I look at them. Those tiny little dots. They call out “crafted”…We are applied, we are placed, with care. They make a pleasing perceived and actual (though I cannot see from image, I am sure) texture. It is great to have something hit the eye in this manner. 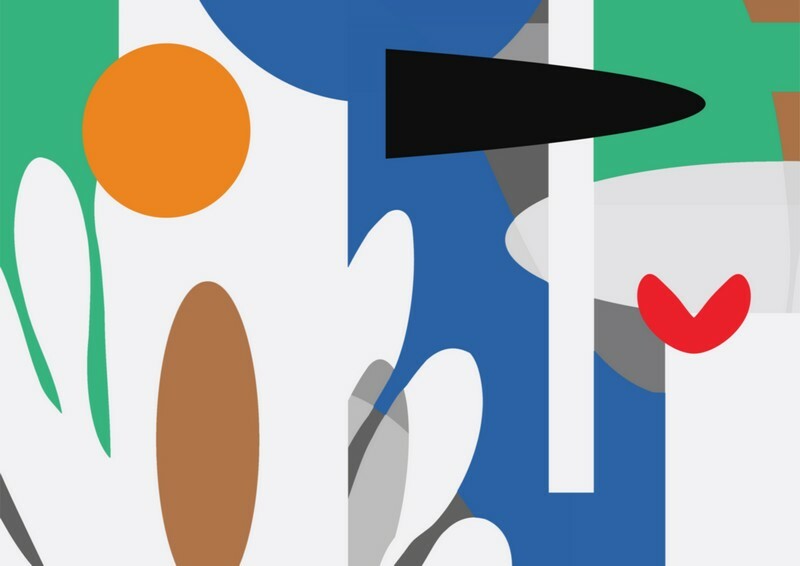 I think it has an energy of it’s own which works very effectively against the areas of flatter colour, though again, I suspect that, face to face, I would see a lot of what I am missing by just using an image. There are other more subtle things going on. But to have the obvious and heightened surface…to have it meet your eye in this way is a great visual sensation. There are some patterns in this painting, but the regular areas both cover and reveal…they do this by being a covering but also making me think of the substrate underneath, in this case the linen. Here is another of the prints from the forthcoming exhibition at Baker Tilly in Guildford. There are other options for different types of prints on the Photobox Gallery, but at the present time I am restricting the distribution of my work over the Photobox Gallery to just A2 and A2 prints. However, if you do want something specific, just contact me with your requirements and I am completely free, (thanks to not limiting these images to “limited edition”) to arrange to have prints made to varying specifications and to be signed and numbered. Prints which come from me personally are signed and numbered, even though not limited in number. The laminated and mounted prints which will be on show at Baker Tilly are signed on reverse with both my signatures. I have two signatures, one is a combination of my initials and the other my usual signature which I use in daily life. I tend to sign paintings just with the combination of my initials and prints with both. I also sign my paintings on the back, as I don’t like to put marks on the front of my work. Sometimes I do with drawings. But it depends on the work. I always use my initials signature, for all my work now. I like the way it can be used on any material, for example, clay and even stone, quite easily. 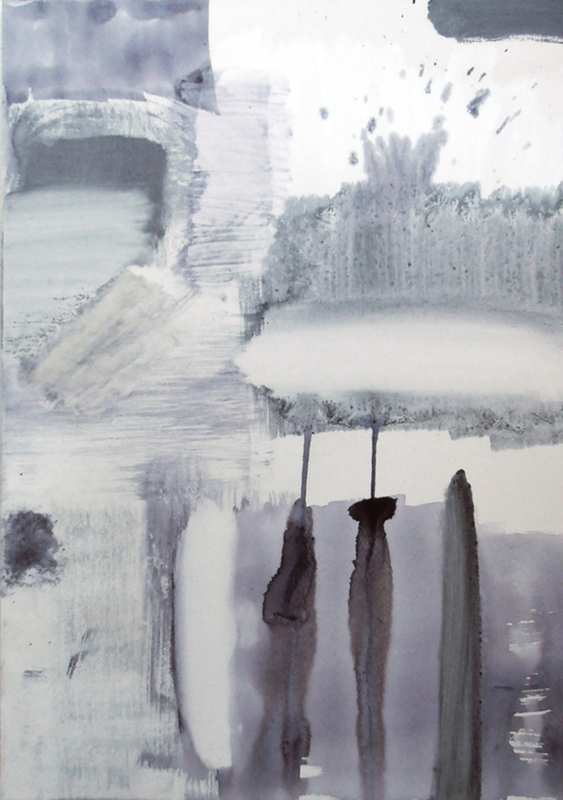 Jenny Meehan is a painter and designer based in East Surrey/South West London. Jenny Meehan BA Hons (Lit.) PGCE also offers art tuition. Please contact Jenny at j.meehan@tesco.net or through the contact form at www.jamartlondon.com for further details. Commissions for paintings are also undertaken at affordable prices. Jenny Meehan works mainly with either oils or acrylics creating both abstract/non-objective paintings and also semi-abstract work. She also produces representational/figurative artwork, mostly using digital photography/image manipulation software, painting and drawing. Both original fine paintings and other artwork forms (prices ranging from between £60 and £700) and affordable photo-mechanically produced prints are available to purchase. Enquiries welcome. I have more artwork than I can display on the internet, so let me know if you are looking for something specific in terms of style, function, or subject matter. Jenny Meehan exhibits around the United Kingdom and holds regular Open Studio/Studio Sale events. To be placed on Jenny Meehan’s bi-annual mailing list please email j.meehan@tesco.net requesting to be kept up to date. Also, you could follow the Jenny Meehan Contemporary Artist’s Journal at WordPress and keep informed that way. I would be very pleased if you would choose to “follow” the Jenny Meehan Contemporary Artist’s Journal at WordPress and keep informed of what I am up to this way. Just press the “follow” button and pop in your email address. You determine how often you get updates and you don’t need a WordPress account to follow Jenny Meehan Contemporary Artist’s Journal. I don’t have a Facebook page as yet, and won’t be on Twitter. So this is the best way to follow my art practice. Though I ramble on, I try to organise things for easy skimming, so you can pick and choose according to your own interests quite easily! Notice regarding my use of images on my Jenny Meehan Artist’s Journal blog: I always try and contact the relevant artist if I include images of their work on my blog and make clear the source. Where images are taken from other websites, I make it my practice to cite the source and normally include a link to the place where the image was found. When I include images I do so in the belief that this will not cause commercial harm to the copyright holder. I believe that this is fair use and does not infringe copyright. Images are used in order for me to comment and reference them in relation to my own creative and artistic practice. When I include extracts of text, I also do so with the understanding that again, this is permissible under the widely accepted fair usage terms with respect to copyright. The photograph (NOT from Portland!) above is one I prepared for the St Paul’s Church of England, Hook, Surrey website. I don’t take so many photographs now as more focused on painting and drawing, but there is still a certain pleasure in “finding” pictures and they serve as a useful reference for myself in terms of tracking and recording my own visual interests. It is also of course nice to share them and good if they serve some useful purpose for others, ie, being used on the church website! With all the rocks to follow, I thought a bit of sand would be nice. This year I am looking forward to a return trip to Verne High Angle Battery…A historic monument which our children had immense fun exploring. Standing at one opening and shouting and speaking in a haunting voice so that it runs along the passageways and comes out the other way is excellent fun and it is an interesting walk around that part of Portland. The battery was built as part of Britain’s Coastal Defences in 1892 and is located in a disused Portland Stone quarry at the northern end of the island. It is built of Portland stone, concrete and brick. After the Great Fire of London in 1666 Portland Stone was used to rebuild many buildings, some of which I often visit, for example, the British Museum and Somerset House. The facade of Waterloo Station is also Portland Stone, and it was used by Sir Christopher Wren in St. Paul’s Cathedral too. These are just a few of the buildings in London built of Stone from Portland! It is always nice to be invited to exhibit, and this has happened to me for the first time ever this year! I will show four paintings and four digital prints. The paintings are from a flurry of painting activity over 2012 (I won’t say, a “series” of paintings, because it is more of an explosion of paintings!). The digital prints are from a series, as I worked on them with a more predetermined aim right from the outset, and are examples of an intense period of experimenting over the Christmas period at the end of 2012/the Spring of 2013. I called the series “Signs of the Times”. The prints which will be on show at Baker Tilly are signed on reverse with both my signatures. I have two signatures, one is a combination of my initials and the other my usual signature which I use in daily life. I tend to sign paintings just with the combination of my initials and prints with both. But it depends on the work. I always use my initials signature, for all my work now. 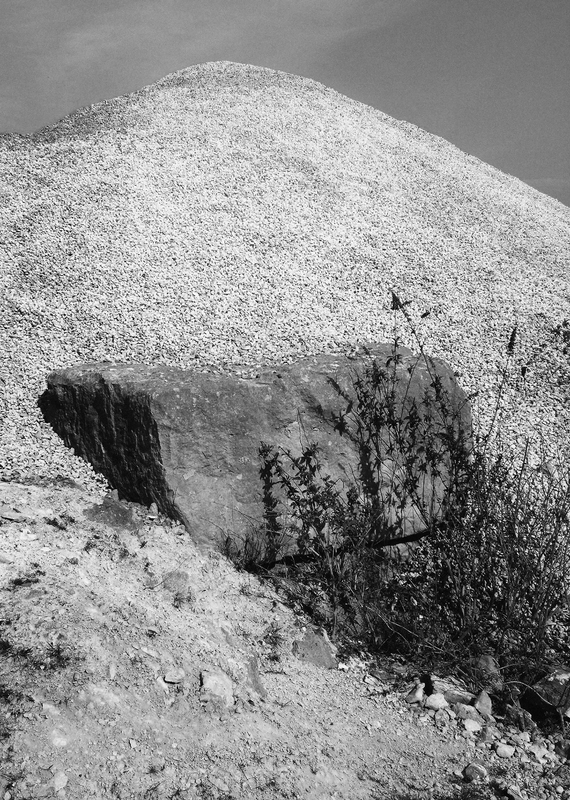 I like the way it can be used on any material, for example, clay and even stone, quite easily. There are other options for different types of prints on the Photobox Gallery, but at the present time I am restricting the distribution of my work over the Photobox Gallery to just A2 and A2 laser prints. However, if you do want something specific, just contact me with your requirements and I am completely free, (thanks to not limiting these images to “limited edition”) to arrange to have prints made to varying specifications and to be signed and numbered. Wanting a chance to show you some of (Not all! You will need to come along to the exhibition to see all the work on show!) 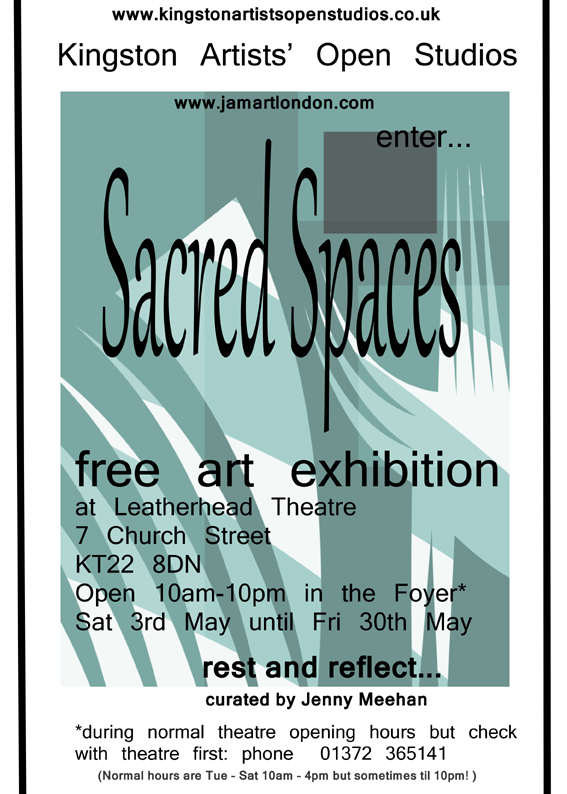 the wonderful artwork which will be on display at Leatherhead Theatre this May. If you are interested in this exhibition and are willing to help me promote it, then contact me at j.meehan@tesco.net, or through LinkedIn or through my website contact form at www.jamartlondon.com and I will send you a high resolution image of the flyer below to print out. Just displaying it may mean that someone gets the opportunity to enjoy it. Anyone with an interest in art and creativity, spirituality and contemplation would enjoy it very much indeed. Below is are some examples from some of the participating artists and I will post some more up on the next blog entry also. I enclose the text which is written by the artists themselves about their work and has been combined into an Artists Information document which will be displayed with the work when the exhibition runs. 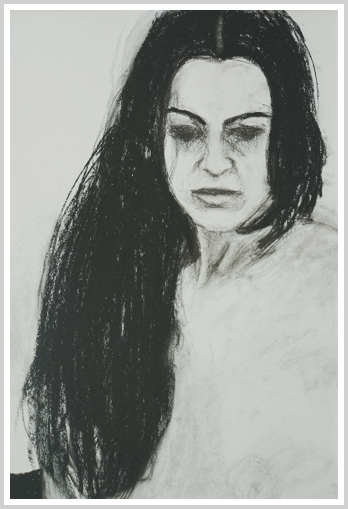 Lula – this charcoal study of Lula was produced one autumn Monday morning. Perhaps she is reflecting on the weekend just past, or her sister and family in far away Venezuela. There’s a sadness to her mood, a far away-ness that is made more poignant by her pale skin against her lustrous, long black hair. The search for emotion – the reflection of the interior life – is the aspect of portraiture that I find so fascinating and equally illusive. To me she seems melancholy, but as so often with portraiture, the portrait says as much about the artist’s state of mind that is reflected in the image created. Richard studied graphics at Portsmouth College of Art and practiced as a graphic designer in London. During 2013 he decided to refresh lost skills in drawing and painting. Inspired by the work of Lucian Freud, Andrew Wyeth and Alison Lambert, led him to focus on the human figure and portraiture. 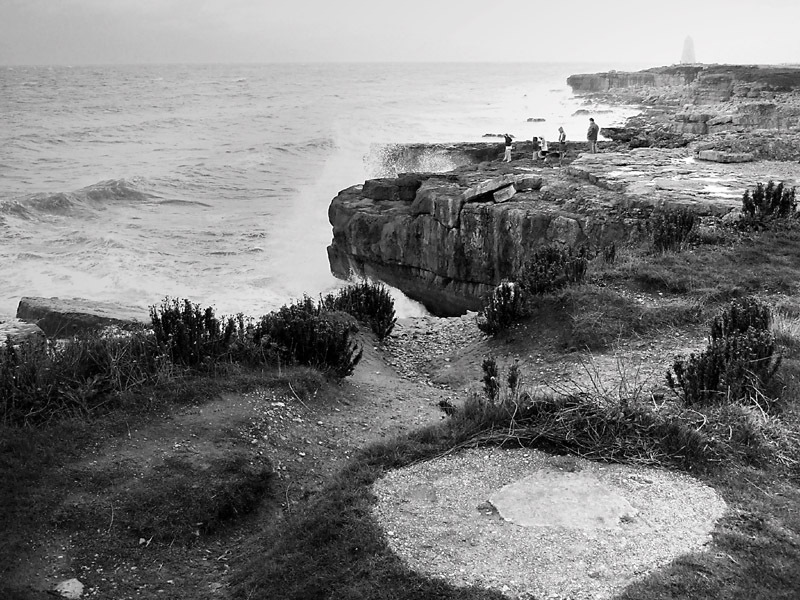 Richard’s work is often the result of long periods of observation, the images gradually edging towards realisation. The discovery of charcoal has been a joy, black is one of the most important colours in his palette. 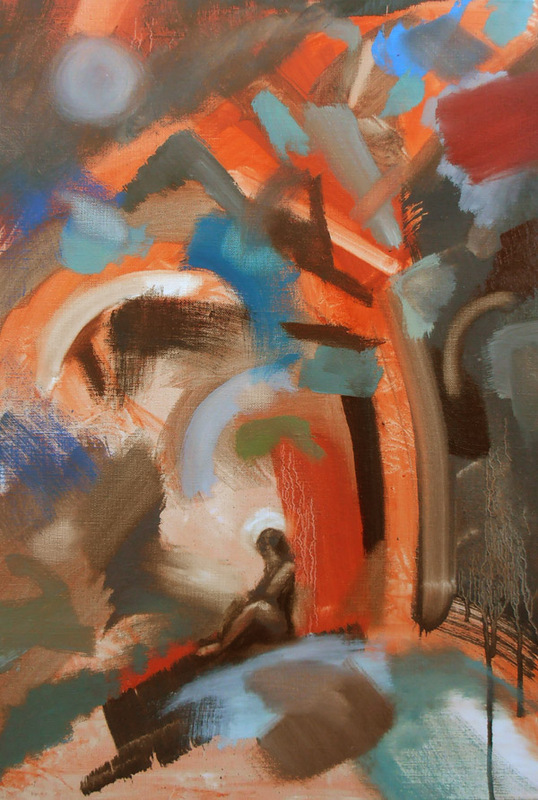 His current work is focused on the search to express emotion through the image. The two examples of my work on show are from a strand of my practice that is inspired by place. I don’t set out to record a specific scene, but to capture a memory, a feeling and a sense of place. I aim to express my emotional response to this place. The places that inspire me in this way most often include still, or slowly drifting water that gives scope for reflection. 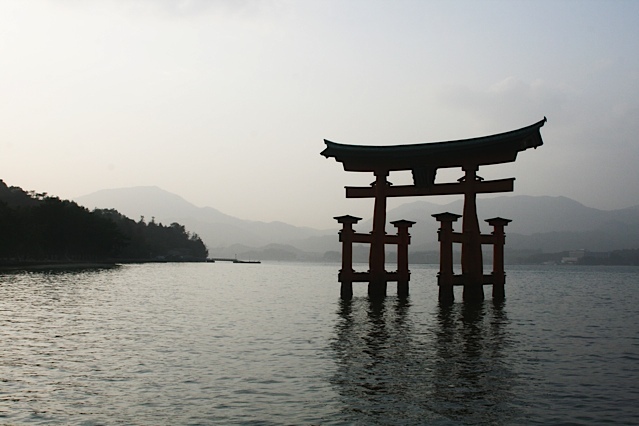 Often they also include a symbolic feature such as a jetty or temple. Subconsciously I am seeking a place of contemplation or meditation – my inner sea of calm. I think that subsequently my work does very often have an ethereal and contemplative quality. I originally trained at art school as a theatre designer and spent many years as a professional designer of both sets and costumes. An important aspect of this work was to produce a series of visuals to express the atmospheric lighting changes of the different scenes. Now that I paint fulltime, I find that it is the light and atmosphere that provides the starting point for my work. I use a limited colour scheme to intensify the image and bring a heightened sense of atmosphere. Committee member and Art History lecture organiser for Richmond Art Society. Part of the exhibition process will be a meeting between the artists through which we are able to discuss how our art working and creativity relates to spirituality and the idea of a “sacred space”. Hence the exhibition title “Sacred Spaces”. I will be posting more information about the artists taking part, including what they have to say about the work they are showing in the exhibition, over the next couple of months. I also plan to use what we have discovered through our discussion and thinking in the formation of the text which will accompany the visual art. I have found when organising exhibitions in the past, that the last couple of months need to be devoted to publicity as much as possible, but with most of the other admin tasks mostly done, I should have time to promote the exhibition as well as doing the rather more interesting and rewarding task of researching and writing, assimilating and reflecting on the whole process so far. Clyde kindly was happy for me to include images of his paintings in my blog, which is helpful, as much easier to comment on individual paintings that way! I will, over the next few Jenny Meehan Journal posts, draw your attention to some which have caught the little fishes that swim through my mind the most. I am only using digital images to base my comments on, so my response is limited significantly by the absence of the painting right before me. I was planning to fit into this post, but I don’t want to do the paintings a disservice by trying to reflect on them in a rush. Right now things are a bit too hectic for me to do them justice, so better not to write anything in haste. As ALWAYS my Jenny Meehan Journal is far too long! However, I don’t write it just for you to read, (though it is nice to think it may be read, of course!). I write it to attempt at some kind of narrative which traces and skims playfully along the course of my life. I like the element of process of writing a blog. I chip away in little bits, (even though the end posts are long). The little fragments come together and somehow my piecemeal life takes on at least a little order. I worry I will look back in years and cringe. But never mind. We are all entitled to change, and writing is only writing, after all. It’s not written in stone! Even if it was, it would wear down with time. 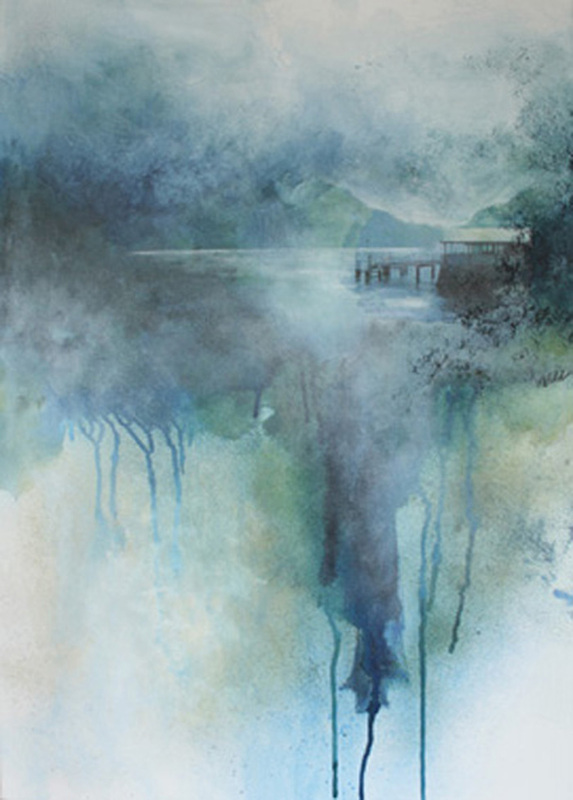 Jenny Meehan exhibits around the United Kingdom and holds regular Open Studio/Studio Sale events. To be placed on Jenny Meehan’s mailing list please email j.meehan@tesco.net requesting to be kept up to date. Also, follow the Jenny Meehan Contemporary Artist’s Journal at WordPress and keep informed that way. Just press the “follow” button and pop in your email address. You determine how often you get updates and you don’t need a WordPress account to follow Jenny Meehan Contemporary Artist’s Journal.